Noogle is played like the game Boggle, but uses numbers instead. Students are challenged to find a string of numbers that meet the different categories. 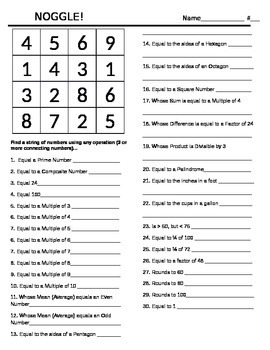 Students may use any operation (addition, subtraction, multiplication or division). Great for GATE students, early finishers, or as a Math Center activity. Product comes as a Microsoft Word document so that you can change the numbers as often as you would like. You can also keep the grid blank and have students write in their own numbers or post numbers on a bulletin board.